Amethyst Color Shown, February Birthstone available in all Birthstone Colors. Stones are man made CZ's and Crystals, their may be color variations due to the size of the stones and the different suppliers. 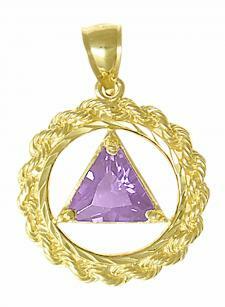 This 14K Gold Pendant is AA symbol triangle with a chain circle. Very unique! This is a handcrafted piece so please allow up to 2 weeks for delivery. CHAIN NOT INCLUDED. Also comes in Sterling Silver.